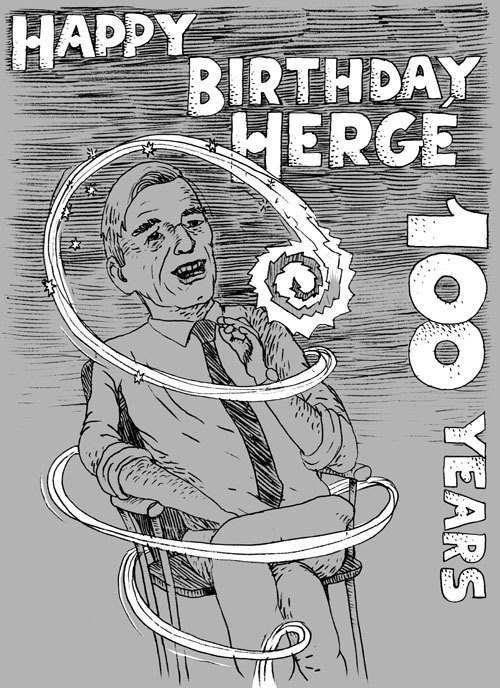 To commemorate the centennial – on May 27th – of Hergé, creator of Tintin, the Metabunker asked a number a Danish cartoonists to contribute commentary/tribute drawings, which we posted daily the week following the day itself. These are now scattered around our archives as individual posts, so we thought it helpful to collect them all in one place. Here you go. Each drawing is followed by some info on the artist and directions to places where you can learn more. Part of the innovative 70s generation, Smet has emerged as one of Danish comics’ prime virtuosi. 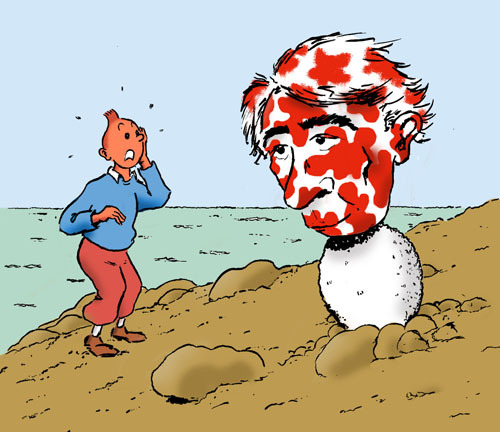 Read more about him here, check out this small archive of his old work, and be aware that BLÆK contains some of his very best comics work (in pantomime, so there’s no language barrier!). Miwer is a stalwart of the infamous, now defunct Fort Kox studio and part of the current setup at Over floden. Johan Krarup, one of the premier representatives of the new Danish underground and part of the Over floden studio. Read his weekly strip “Mixed Double” here, His publishing outfit Son of A Horse can be found here, and he sometimes writes a column about alternative comics here. Johan is also a philosophy graduate and blogs about it here. Inspired by the back covers of the old Danish editions of the Tintin books, this drawing is by Peter Kielland-Brandt, one of the veterans of the innovative 70s generation of Danish cartoonists and one of our most original voices. 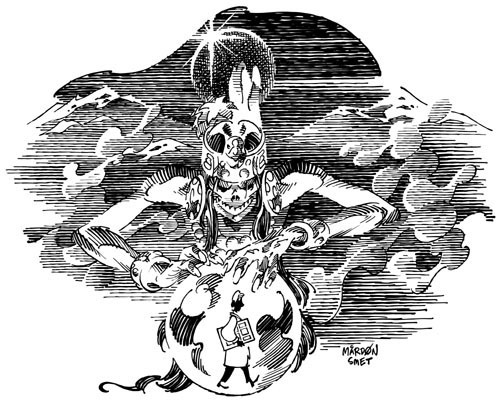 His website can be seen here, his Lambiek entry here, and an archive of assorted old work here. An American edition of his masterful pantomime Fish is available and can be purchased here or here, while the original Danish edition is available from Fahrenheit. In 2006, he finished his epic, 10-years-in-the-making Jernpotte, which unfortunately has not been translated but which anyone who can read Danish should take a look at. 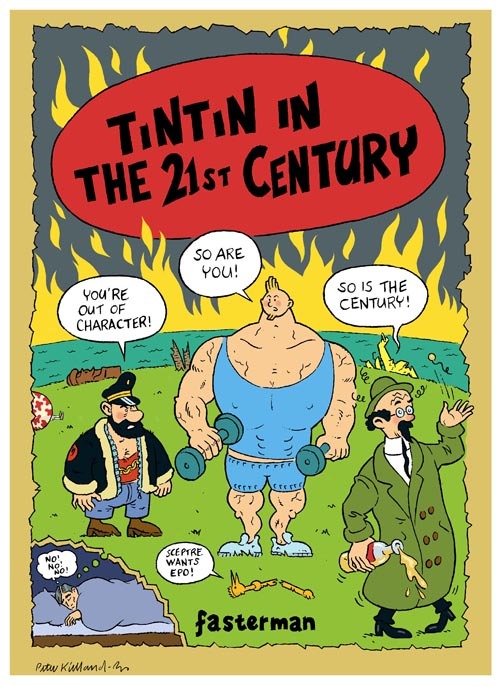 This drawing, which refers to the wrong number gag that runs through several of the late Tintin books, is by Ole Comoll Christensen, one of the most versatile comics artists on the Danish scene. Ole works within classic mainstream idioms as well as different experimental styles: his books includes the imaginative parallel dimension detective series Dimensionsdetektiven as well as a number of small press books and a long list of innovative anthology work published around Europe. American comics readers may know him without being aware of it from his extensive background work for Peter Snejbjerg on a number of DC and Vertigo titles. Visit his website here and read his Lambiek entry here. This drawing is by the Bunker’s own T. Thorhauge. 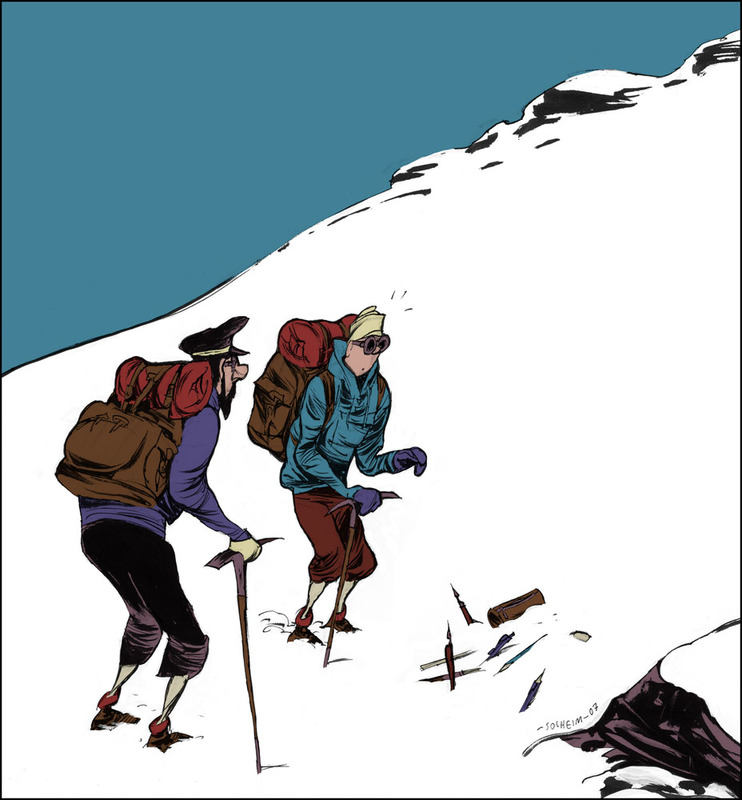 His debut, Det der går forud is still available from Fahrenheit, and the French edition, Table rase, published by Éditions Rackham, can be acquired here. Other significant comics work can be found in Rackham #2, 4 & 5 as well as Forandringstegn and the two BLÆK books – see our ‘works’ section for more info. He doesn’t have a website besides this one, but a lot of his writing can be found at Rackham. Also, there’s a really old interview with him here, and another here (both in Danish, unfortunately). 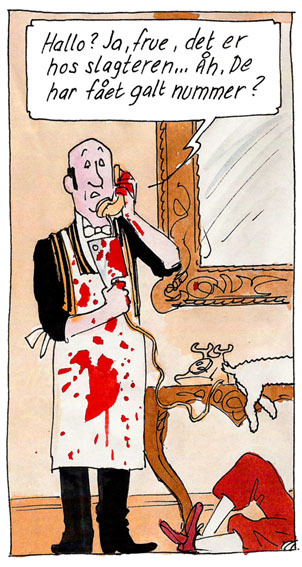 Bukhave is one of the most promising young Danish cartoonists. So far, Simon has created two beautiful comic books, Ghost (2002) and Alt hvad jeg har i min ene hånd (2006), both wordless and meticulously drawn in black and white. Simon also contributed to BLÆK, the French edition as well as the Danish (check them out in our ‘works‘ section). Visit Simon’s site and read his entry in Lambiek. Simon is part of Studio Over Floden in Copenhagen, working with Mårdøn Smet, Miwer, Johan Krarup and T. Thorhauge. Peter Becher is one of Danish fandom’s movers and shakers. Deeply involved in Danish fandom as a consultant and translation coach for the editors of the Complete Carl Barks, currently being published in Scandinavia, as well as co-editor of the legendary Nørd Nyt (‘Nerd News’), as well as the online nerd haven SerieJournalen (for which he has done a special Tintin pop quiz – in Danish, sorree! – for the centenary), his credentials are not to be fornicated with. Solheim is known for a large number of at times hilarious, at times touching, and always dazzlingly drawn anthology contributions, two of the best of the more recent ones in BLÆK, for which he also did the amazing cover (read his comments on it, and see sketches here). His grand epic “Lava,” serialized in the anthology Fahrenheit in the 90s, remains unfinished but is nevertheless considered classic. American readers might remember him from the story “Drive-By”, written by Steven T. Seagle in ONI Double Feature a good number of years back. Check out his website here, an old archive of his work here, and his Lambiek entry here. Also, be sure to read our freewheeling discussion of Tintin. 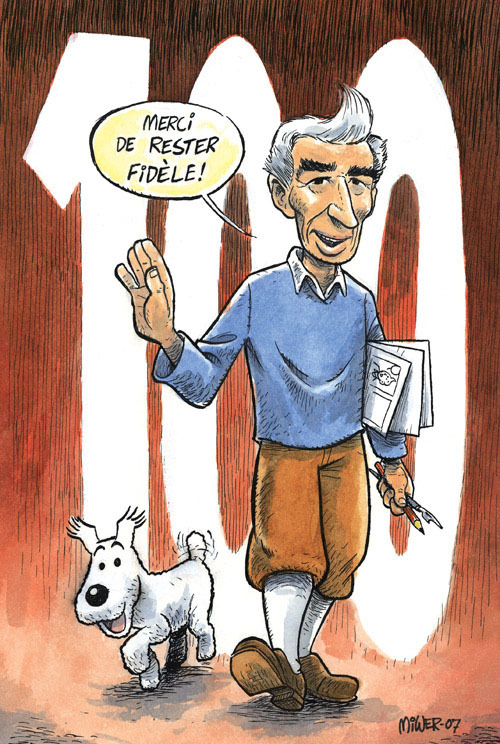 Long live the work of Hergé! And on a related, though also different, note, check out much the same crew – give and take a couple giving their take on Will Eisner’s passing and legacy, back when that great master passed away.